If you're planning on traveling around Morocco, using the country's train network is a great way of doing so. Affordable, clean and surprisingly punctual, Moroccan trains are easy to use and connect many of the most popular tourist hotspots. One such hotspot is Fez, the imperial city in the north of the country known for its ancient medina and colourful leather tanneries. 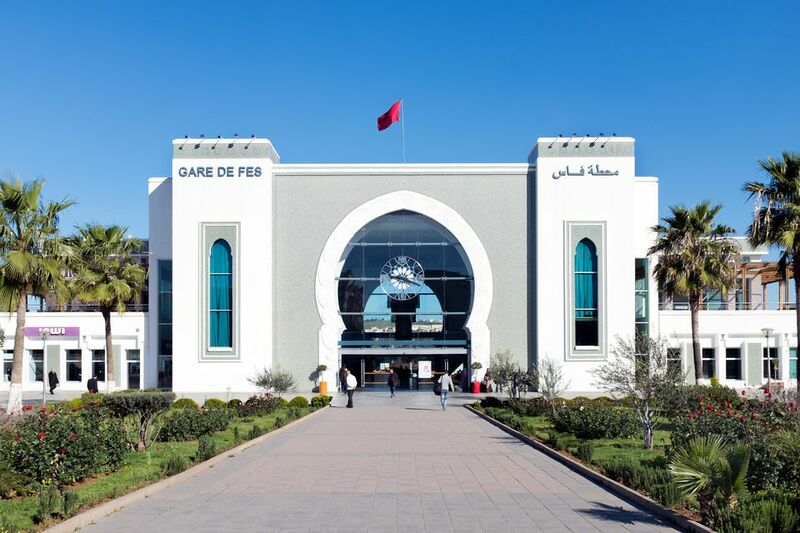 Fez's station is relatively small, yet offers efficient services to many key destinations including Casablanca, Tangier, Meknes, Rabat and Marrakesh. There are several ways to purchase tickets for train travel in Morocco. Usually, there is no need to book in advance, as services are plentiful and carriages are rarely full. Accordingly, the easiest way to buy tickets is simply to arrive at the station in time to purchase them from the ticket office ahead of your intended departure. However, if you plan on traveling during peak holiday times, pre-booking may be necessary. You can buy tickets from the station in person a few days in advance, or ask your travel agent or hotelier to arrange them for you. Alternatively, it is possible to reserve tickets via the ONCF train network website. Although the primary page is in French, you can select English or Arabic versions in the top right corner. Most Moroccan trains are divided into first and second class compartments. In first class there are six seats, while second class compartments are slightly more crowded with eight seats. The price difference between the two classes is minimal, and booking first class gives you the advantage of being able to reserve a specific seat. This is a bonus if you particularly want to sit by the aisle, or if you're looking forward to admiring the Moroccan scenery from a window seat. In second class, seats are occupied on a first come, first served basis. If you're traveling on a regular day (i.e. not during peak holiday times) you will probably still have a choice of seats. Below you will find train timetables for travel between Fez and some of Morocco's other major cities. Please note that although these times were accurate at the time of publishing, schedules may change and listings should be used as a guideline. Make sure to double check schedules on the ONCF website before planning a specific journey. The train from Fez to Casablanca's long-distance station, Casa Voyageurs, stops en route in Rabat and Meknes. The train from Fez to Marrakesh also stops in Meknes, Rabat and Casablanca. This article was updated and re-written in part by Jessica Macdonald on December 19th 2018. Do You Need a Guide to Visit Fes, Morocco?